Iperius is a complete and professional backup software for Windows. It's also available as freeware, with numerous options and a great flexibility. A stable and reliable software for computers and servers, the definitive solution to protect your data. Do you want to become a RESELLER ? In addition to being available as a Freeware, Iperius Backup is provided with one of the easiest licensing and installation system available. One installation file for all program editions and all Windows systems (including server systems such as 2003, 2008 or 2012), activation of the various licenses by entering a simple code, and a very affodable price, which includes updates and phone support. 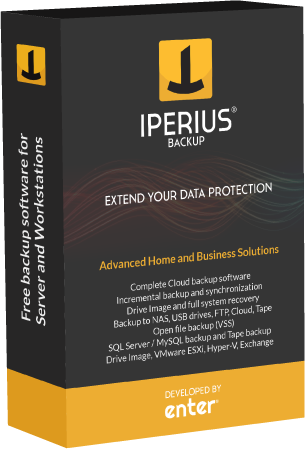 Iperius Backup is a software designed and created in a company with many years of experience in software development and IT consulting to thousands of customers, with the contribution of professionals with high skill in the areas of backup and data protection. Relying on Iperius Backup means relying on a top-level support service and an high quality product. Iperius Backup is an high-performance software, but with very low resource consumption. It's lightweight and portable, in addition to being perfectly stable. For these reasons, it is never a problem or risk to install Iperius even on critical server systems. Its flexibility makes it a handy utility to make many copy/data transfer operations for any-size companies.